According to some documents published online and described as official, and partly confirmed by important international newspapers, China would like to reduce bitcoin mining activities on its territory, a strategy that could have significant consequences in the sector and in the value of cryptocurrency on the market. Bitcoin extraction is the process by which Bitcoin users contribute their computers to the computing power needed to verify and approve cryptocurrency transactions. A number of bitcoins are distributed to users who contribute to this process, which keeps Bitcoin active and secure. If at the beginning to extract bitcoins were enough normal domestic computers, the huge dimensions reached by the system have made the extraction an industrial activity, carried out by companies specialized in large warehouses full of computers and ventilation fans. These centers consume enormous amounts of energy: in total the extraction processes annually consume more than entire small states, such as Ireland, and about 0.8 percent of that consumed in the United States. Most of these warehouses are in China, which contributes according to estimates to more than two thirds of the total computing power required to keep Bitcoin going. But China now seems to intend to forcibly reduce the activity of bitcoin mining companies on its territory. Elly Zhang, manager of the cryptocurrency software company Blockchain, has released on Twitter a document from the Group for the Prevention of Economic Risks of the Internet, a Chinese national agency that deals with the economic regulations of the Internet, which invites local administrations to “drive »The bitcoin mining companies towards ‘a controlled exit’ from the sector. Prior to the release of the document, a source in Reuters said the Chinese Central Bank had talked about the need to restrict extraction activity in a closed-door meeting with the Group for the Prevention of Economic Risks of the Internet, which was confirmed also from Bloomberg. The official document says that the extraction has caused “a huge waste of resources and an increase in speculation”, and suggests to local governments to apply the limitations with rules related to the consumption of electricity, land occupation, taxation and environmental Protection. 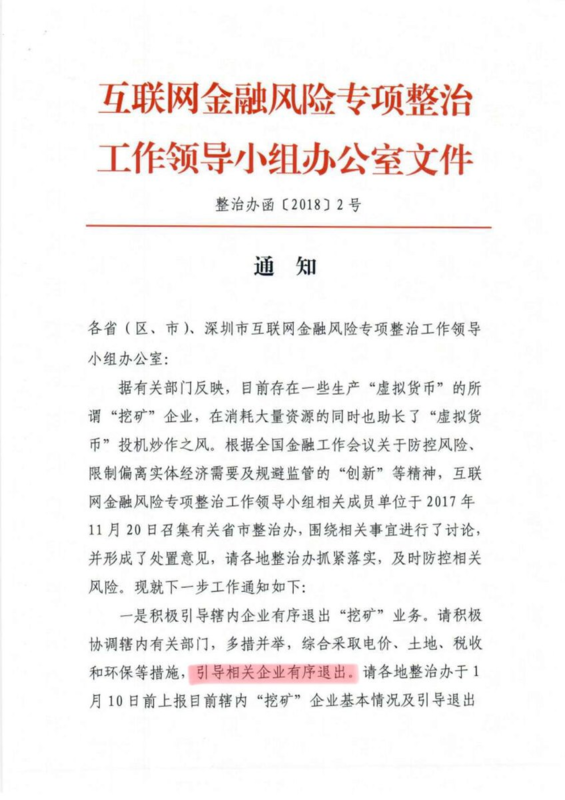 Another official document, whose authenticity was confirmed by Quartz, prescribes to the local administrations of the western regions of China to prepare a monthly report on the state of the reduction of mining activities. According to Bloomberg , the Chinese authorities are concerned that bitcoin mining companies have benefited from the advantageous electricity prices in some areas of the country, but have ended up damaging the local distribution network. The decision to reduce extraction activities seems to have mainly reasons for optimizing electricity at the national level, and for improving distribution in less-served areas. But according to Quartz the intention is also the more general one to put a limit to the cryptocurrency sector, which brings with it great risks for small investors, which in China are very many. It would not be the first time that China has taken drastic measures to limit the cryptocurrency sector. Last September it prohibited the ICOs , that is the operations with which the new cryptocurrencies are financed by selling their own units in exchange for other cryptocurrencies, mainly bitcoin and ethereum, outside any regulation and potentially dangerous for the stability of the markets, as well as the interests of banks and investment funds. Shortly thereafter, China banned cryptocurrency exchanges to its citizens on Chinese platforms, forcing operators to move abroad. Some bitcoin mining companies are already doing this, according to Bloomberg : Bitmain, one of the most important, has opened offices in Singapore and mining centers in the United States and Canada, where it will also open one BTC.Top. ViaBTC instead chose the United States and Iceland. But there are also those who have doubts about the real size of the operation of the Chinese government, because the mining centers, while sometimes destabilizing the electricity grid, pay a great deal in bills and taxes. Then there are those who point out the difficulty that the authorities would have in locating the many small “domestic” mining centers, widespread especially in the Sichuan and Yunnan mountain areas. If indeed the mining activities in China should decrease, without being immediately compensated by those in the rest of the world, it would slow down the process of distribution of new currency, with the consequence that the value of bitcoins could increase again, after the peak reached in December . On the other hand, the possibility that the Bitcoin system will experience significant slowdowns in transactions seems more remote.